Here is my tag for the Cute and Cuddly Challenge from Tag You’re It. Thank you for stopping in to look. 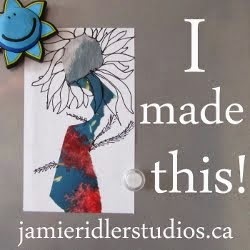 In doing this tag, I realized I only have holiday words on stamps and none seem to fit either in context or size. So I have something else to shop for when I go to the city next time. I felt like some text was needed to fill some of the space, but opted for the little ribbon, instead. Fibers and ribbons from ???? The under tag of cream cardstock seemed too bland so I tried Adirondack Alcohol Inks in Wild Plum, Stream, and Butterscotch along with the blending solution on acetate and used that as an overlay on the cardstock. Ah how sweet. Love your cuddly hedgehog. 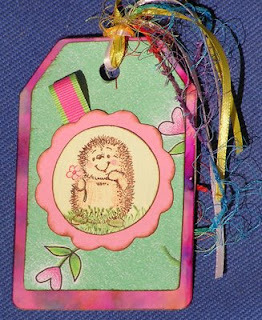 Aww how cute is this image - great tag - love the fibres and the pink background ..
Love this Susie, such a cute little hedgie.